Whether you’ve been playing for 40 years or you’re just getting started, playing the piano is a rewarding and enjoyable hobby that is worth pursuing! Piano lessons benefit your mind, body and spirit. 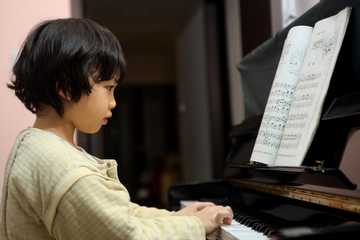 Click here to read about our private and group piano lesson programs in Salem, Oregon. 96% of public school principals believe that participating in piano lessons encourages and motivates students to stay in school longer. The College Entrance Examination Board found that Students in music appreciation scored 63 points higher on verbal and 44 points higher on math than students with no participation in music programs. Playing the piano increases human growth hormone (HgH) production. This is the hormone that helps our bodies grow strong and heal quickly! A study following 130 people over two 10 week periods found that the group that took piano lessons showed significantly higher levels of HgH than the control group people who did not make music. Playing the piano strengthens hand-eye coordination and helps develop fine-motor skills, accord to Dr. Arthur Harvey and the American Music Conference. A Columbia University study found that students in the arts are more cooperative with teachers and peers, more self-confident, and better able to express ideas. Playing piano can reverse stress at a molecular level, according to studies conducted by Loma Linda University School of Medicine and Applied Biosystems. With all the benefits to be had, why not learn how to play? Send us a message below, and one of our friendly staff will contact you to answer any questions and help you set up a trial lesson.